This was my first book by L.J. Greene, even though its part of a series and haven’t read the others, this as a standalone was a really good read which I thoroughly enjoyed. Keir and Selene meet in the most unfortunate of circumstances – she crashes into the back of his food truck! But their attraction to each other is obvious right from the start, but it is a strong friendship they develop first, each finding something in each other, unknowingly at first that they have a tragic and heartbreaking family trait in common. 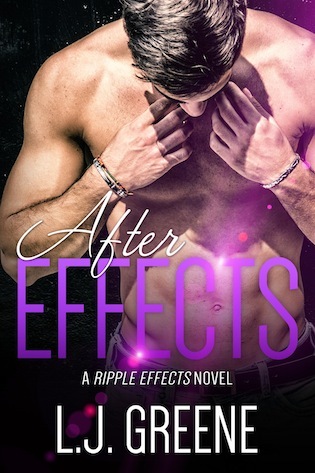 Their connection is so strong and undeniable that this quickly moves from friends to lovers, even though both of them fear this next step, Keir lives in a completely different state and is just looking to open up another business there, and Selene is busy at work with a massive client that takes up all of her time here. Can a long distance relationship work for them? This is quite an emotional read at times, especially with their tragic family connection, both being the rock each other needs. Keir is a wonderful character, even though he is very wary of a long distance relationship having had a failed one under his belt, he can see no other way out, as Selene has got under his skin and he can’t think of not having her in his life. This was the one sided bit of the relationship and Selene was as all in as he was, but didn’t see herself with him in the future, believing the relationship was bound to end at some stage due to their differences in work and living arrangements, though never wanting it to end. The problems they have to work with and around being so very real and it was so very easy to get lost in their story. It was a well written and believable story line and you could easily connect with the characters and what they were going through. Highly recommended reading. Thank you for that lovely message, I really enjoy reading indie authors work and yours was a great read! Reviews posted everywhere I could. Best wishes, Claire. Congratulations on your new book release and on this great review. The cover is gorgeous! This sounds like a must read for me.